Richt, afore ye say onythin: this is a JOURNAL, aye? No a diary. I ken fine whit it says on the front. But when ma Maw went doon the shops I SPECIALLY telt her tae get yin that didnae say "diary" on it. Well seen, eh. Aw I need noo is for some bampot tae spy me cairtin this book aboot and get the wrang end o the stick. The ither thing I want tae get oot the road straicht aff the bat is that this wis ma MAW's idea, no mine. But she's no richt in the heid if she thinks I'm aboot tae stairt writin awa aboot ma "feelins" or ony o that guff. 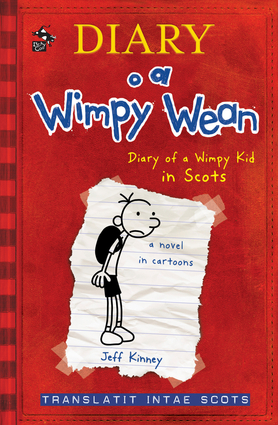 In this Scots translation, 12 year old hero Greg Heffley tells us all about his life in gallus modern easy to read Scots. A great book in any language, Diary o a Wimpy Wean is packed with laughter, gags, disasters, daydreams, and plenty to keep young readers hooked until the very end. Jeff Kinney is the #1 New York Times best-selling author and illustrator of the wildly popular Diary of a Wimpy Kid series. In 2009, Jeff was named one of the 20 Artists & Entertainers in The TIME 100, the magazine's list of The World's Most Influential people. He lives Plainville, Massachusetts. Thomas Clark is a Scots poet, writer, and translator. His most recent book for children was a Glaswegian rendition of Alice's Adventures in Wonderland.